Decathlon are a worldwide sports and activities retailer who offer a wide range of low-cost equipment for horse riding, water sports, climbing, football, running, hiking and plenty more! In this latest offering, Decathlon bring a full outfit to keep you walking through the cold season for under £250 for the full kit. * With technical clothing, fleeces, jackets and matching accessories. The range I have selected and taken out is valued at £135.95 total, which includes a technical fleece, T-shirt, trousers, waterproof jacket and gloves. Enjoy all that nature has to offer this winter with walking gear from Decathlon. Quality products available including technical clothing, fleeces and jackets. The cold season has arrived, but it doesn’t mean that enjoying the breathtaking sights of the countryside isn’t an option. With the right walking gear, the chilliest weather can be held at bay making those leisurely walks in the countryside even more enjoyable. We will start from the top and work our way down, as there is a number of products. Starting with the long-sleeved mountain trekking merino wool t-shirt. “This long-sleeved t-shirt is ideal for country walkers looking to trek for long periods of time. Made with merino wool, this t-shirt will keep wearers dry for longer by absorbing excess moisture. Probably one of the best parts of this line up in my opinion, with multiple uses and advantages with the Forclaz long sleeve mountain trekking t-shirt. The merino wool top also happens to be one of the more expensive items of clothing in the line-up at a retail price of £25. However, don't let this put you off. The t-shirt is very comfortable and is great for hiking in warmer conditions as just a tee or layered with a lightweight fleece in colder conditions. In addition, the tee has been great for running in these colder conditions and whether wearing multiple layers or running the top hasn't rubbed or ended with me feeling itchy. Rather the opposite, it’s a little to comfy! Sizing is something to be aware off with the tee, I am typically a medium in t-shirts and tops similar to this, but I really needed a large as it felt tight around the arms and a little short in length. To add, I was so impressed with the top I've gone out and purchased several more for myself. Colour choices are limited to blue and grey so if you're hoping for anything brightly coloured you may be disappointed. Like with a lot of Decathlon clothing and kit, it's worth cutting the labels out as these can be itchy if left in. After wearing the tee for 24 hours I found the t-shirt did a good job on reducing odours and despite over layering on a hike, the tee also did a great job at wicking away any moisture and sweat. This I believe will make the tee a firm favourite in hotter months. The shoulders have a mesh like material to help reduce sweat and heat build-up where you may be wearing a rucksack. Although this trekking t-shirt might be one of the more expensive items in Decathlons Cold Season hiking line up, it’s considerably cheaper than other brands and in all honesty, I doubt you’ll find much difference between them. Next up, the Quechua MH520 mountain hiking fleece. “Warm and light, this hiking fleece is the perfect ally against the cold whilst enjoying the sights of the countryside. Meanwhile, the elastic fabric means it’s extremely comfortable to wear for those on longer walks. Unlike the trekking t-shirt, the fleece comes in some more vibrant colours with black, blue and lime green and also comes in a variety of weights with MH100, MH520 and MH900, all with different pricing and features. The MH520 sits in the middle of the range bringing a mixture of the features from the fleece range. Something I am pleased to see if this fleece is made from recycled materials which if you visit Decathlon’s website, all products feature an environmental impact rating. So low cost doesn’t mean you can’t not recycle. The fleece has plenty of stretch and much like the t-shirt again is very comfy to wear and makes a great fleece in the all-important layering set up. I have used the range in temperatures averaging between 5-10ºc and between the t-shirt. Fleece and waterproof jacket I have been very comfortable whilst hiking, whether this be in the countryside around the Chilterns, climbing a Welsh mountain or one of Dartmoor’s Tors. The three layers was plenty to keep me warm and protected from any rain showers or wind but also keep me cool whilst hiking up the mountains. Better yet, the fleece, t-shirt and waterproof are all lightweight and easy to roll up when not needed. Meaning they took up little room in the rucksack. The fleece continues to have some great advantages with two good sized zipper pockets with mesh lining so you can quickly see what you may have lost from the inside. Indecently where the pockets have been sown on, you have two internal pockets, but these aren’t advertised so is probably best not to use. However, the pockets are fleeced which is handy for keeping hands warm or offering protection to any belongings you have inside. In addition to the good-sized pockets and compact design, the fleece has several inserts around the armpits to aid ventilation, although small did help a great deal over not having them. The neck is not the highest but does come up just below half way so offers some protection from wind chill but it’s not high enough to cover the chin. Decathlon rate the fleece to provide comfort in temperatures around 9ºc, but I’ve used it lower to 2-3ºc on a cold night with a down jacket too and both provided plenty of warmth when sat around our campsite. “This waterproof jacket offers unrivalled protection from any weather condition, be it heavy rain or wind for those on country walks. The fitted cut of the jacket means that the fabric can stretch easily and can be worn over another layer. The Forclaz 400 waterproof jacket is a lightweight and simple jacket but overall, I like it, again it does the job and is at a relatively low cost. It’s technical rating is great and offers 10,000mm waterproof offering with it’s Schmerber membrane. (30cm of rain for 3 hours). It’s reassembly lightweight at 590g, I’ve used lighter but the Quecha MH500 jacket feels a lot stronger in comparison. It’s all well weighing a mere 2-300g but if its snags on a twig it’s pretty useless in my opinion. I had no issues with this jacket catching on any materials or tearing. Furthermore, the waterproofing is effective, and in the rain, you can see the rain drops simply beading off the jacket. I had no issues with any of the pockets either in the rain, which the jacket has four, three waterproof pockets on the exterior and one on the inside which like the fleece is mesh. All the pockets are a good size, but none are fleeced so don’t offer much in terms of warmth but certainly protection from the rain or wind. The chest pocket is the smallest of the four pockets and can just fit an average sized smart phone. The two main pockets on the side are very big and I could happily fit my camera inside with a large lens attached which I was very surprised by and also very helpful when it did rain. The interior pocket can fit an OS map inside. 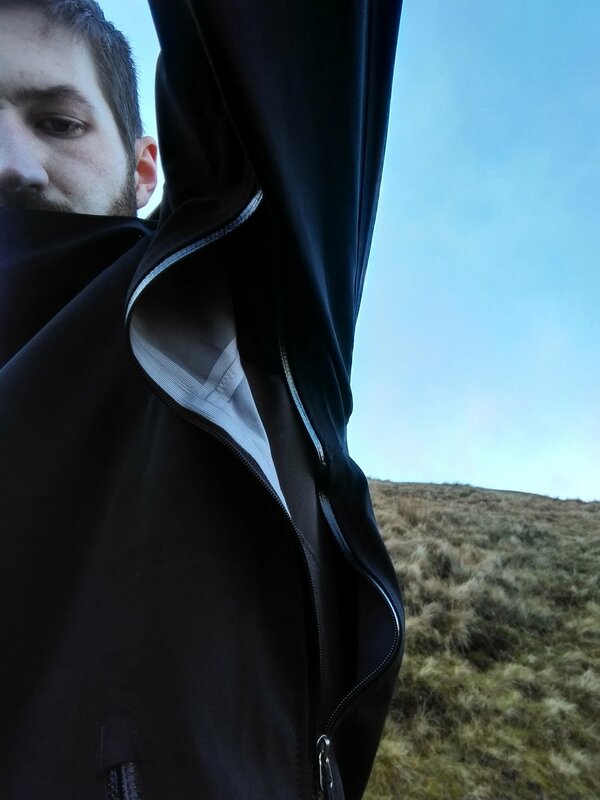 The jacket is breathable and as I mentioned above with the fleece in combination, I didn’t have any issues with over heating or sweating when hiking up a Tor or mountain. The jacket has two very large! 30cm openings below the armpits which is great and when it’s not raining does a good job at keeping you cooler. However, with no mesh or further protection on these openings, you better remember to close them off when it does rain as you may find water leaks in. When you don’t need the jacket, it rolls up and compacts down to a good size, similar to a 500ml bottle, small and light enough to not notice it inside your rucksack and can be stored in the top lid or in side pockets for quick access. Finally, the hood of the jacket is a good size, not large enough for any helmets. This jacket is aimed at walkers after all, but the hood of the jacket has a peak to provide some protection from the rain getting in your face but it's not stiff so can flex in high winds but does mean it's easier for packing away. The hood itself can be adjusted at the neck line or rear to help keep it on your head in windy conditions. The neck/chin adjustment are easy to use and do the job. Covering the mouth and chin. The rear adjustment on the hood also does the job but do note when the hood is up, you can feel the plastic clip through the material which is a little annoying but doesn't hurt or rub. “Designed for keeping hands warm and toasty in the cold with the polyester fabric, these trekking gloves are ideal for country walks this winter. Wearers won’t have to compromise their freedom of movement nor will they have to take the gloves off to operate their smartphone, thanks to the touchscreen compatible thumb and forefinger. You won't be using these for diving in snow or ice climbing but as a layer to protect your hands in cold conditions, between 4-10ºc then they are a great all-round glove. Even down to freezing with some frost I found were good and better, yet the touch screen elements actually work! Not just a little bit but completely and I had no issue unlocking the phone to navigating webpages or using maps and taking photos. Whether in cold or warm conditions and the gloves themselves have a reinforced rubber palm to help maintain grip on a phone, GPS or other items you may have the hand. The gloves can feel a little tight on the hand and even though wearing an XL glove I found the stitching inside the glove left a mark on my hands. Nothing to cause discomfort or issues but worth buying a size up and trying in store. As a whole however, the gloves had plenty of movement and stretch and as stated above, I have had no issues in holding phones, GPS, maps, poles or camera. The gloves aren't waterproof but did dry-off quickly and I've found they've been very useful for cycling in the colder months. We finally saw snow come the end of January 2019 and the gloves have made a great base layer and wearing a thicker waterproof snow mitt. As the Quechua gloves are touch screen, I can use them in conjunction with the mitts as my mitts have finger caps, I can continue to use my camera or tech without having to remove every layer. Finally, the gloves have a leash so you can hang them or tie them in to something on your rucksack lid as well as a buckle on either glove means you can connect them and not lose one of them. The clip was easy to use in the wet or cold. “These tights are designed to keep wearers warm in the coldest weather this winter. Featuring brushed microfleece on the inside and outside of the legs, the tights act as an insulator for added warmth when walking outside. Meanwhile the polyester knit allows water vapour generated by the body to escape, so that they stay fresh for longer. “These trousers are the ideal companion for the countryside walker who is looking for a lightweight pair of trousers. Made to maximise movement, these trousers are close-fitting and feature a two-way stretch fabric for better comfort. There are two elements to the trousers/lower legs. The MH500 mountain hiking trousers, retailed at £25 and the mountain trekking tights, retailed at £7.99. Combined together you can get a very warm set of hiking/walking trousers or extend any of your traditional walking trousers which aren’t fleece lined or up for the conditions of a cold Winter. The MH500 trekking trousers are comfortable and for most will find the basic trouser, suitable and everything they need for a countryside walk. If you need something a little more technical for taking for longer walks over multiple days or mountain walking, then you may find these entry level trousers not up to par. For one the trousers aren’t weatherproof or windproof for that matter so aren’t suitable for anything more than a very light and short shower. The benefit they do have is they are very light! Weighing a mere 370g and have plenty of stretch. Yes, they’re not weatherproof but are quick drying and on a short walk around Mynydd Du forest over the festive period in the rain, I found the trousers with the hiking tights was plenty warm and comfortable and wasn’t any concern with the light shower and mist blown through. The trousers do have a variety of pockets, with four in total, 2 with fastening, 1 thigh pocket and 1 back pocket. The two pockets immediately by your hands do not have fastening nor extra fleece or protection. In fact, they are a little small and you’ll struggle to fit a phone inside. Plus, the fact they’re not fastening you wouldn’t want to start running down any mountain side out of risk of losing something, falling out of the pockets. The lower pocket on the thigh does have a zipper but it’s not weatherproofed and again is rather small but did manage to fit a standard phone inside and close with no issues. Just relying on these trousers without the tights I wouldn’t use them below 10ºc, especially on a windy day you will find the wind chill will cut right through and make you feel especially cold. With the tights you could extend the temperature range down to 5ºc but the trekking tights don’t offer anything in terms of weather or wind protection, only warmth. I did find the trekking tights the best option and could be used with a variety of trousers or on their own to provide warmth in a sleeping bag or just lounging around the house in. Much like the merino wool t-shirt we were thoroughly impressed and went and purchased a couple of more for the colder weather. Coupled with a pair of jeans for extra warmth working around the studio or walking to work, an extra layer below running tights on very cold days or as intended for, below hiking trousers really added extra comfort and warmth on snow days, ice and frosty mornings. At £7.99 they were a great buy and cost effective for providing that extra warmth. The fleece material feels good on the skin and doesn’t rub, whether used on their own or below other trousers. They’re aren’t the most breathable tights so if you don’t need them, take them off or as I found in plus 10ºc temperatures my legs felt sweaty. Also worth noting, the trekking tights do not have pockets but do make great long johns for cold nights. The Trekking tights below trousers can be a little awkward to put on but, if you try to put trousers on over the top whilst wearing the tights you will find they grip the material and ride up, leaving your lower legs bare. The best method was to put the tights on the trousers before putting either on. This meant you could adjust the fleece material to fit. Taking the tights off is a similar method, but a lot easier compared to putting them on. When not needed the trekking tights are light enough to store away but because of the fleece aren’t that compact. It’s worth carrying a pull cord or stuff sak to help compact them down further. If you do plan on buying the Trekking tights with your trousers, I would suggest buying a size up on the Hiking trousers as the tights are thick and will find stretches the trousers a little. The trekking tights when purchasing doesn’t have any guides to sizing. I found the XL was the perfect length at 6ft 2 and didn’t feel loose around the hips. The two trousers together are a great combination and if you added Decathlon’s own over-trousers which can be picked up for £8.99 you will have a good set up for countryside walking and hill walking. Pushing even mountains in Autumn but certainly not with any snow cover. Personally, I preferred Decathlon’s snow range – WHG500 snow trousers which were only £15 more and are weatherproof, windproof and fleeced with larger pockets, all of which are fastened with weatherproof zippers and snow clip for your boots. Adding the Trekking tights with these you could have a great little set up to rival the likes of Rab Vapour Rise Guide trousers which are three times the cost. I took both recently to Snowdonia on Cadair Idris and was warm in the 90mph winds that the mountain was hit by and the -5ºc up top. Overall the range is a great little line up aimed at enthusiasts or new comers to walking and the outdoors. Anyone who is looking for affordable clothing for the outdoors can now enjoy the outdoors in the right equipment and clothing without breaking the bank. In testing and the environments and conditions, the range had several clear stands out items and others which were weaker, but overall the range provided me plenty of comfort and protection in temperatures plus 5ºc any lower, more technical kit was required. Adding a down jacket or thicker outer jacket when it was colder or stood around. The clear stand out items from my experience was the Trekking T-shirt, tights and mountain gloves had the most use and could be adapted very easily with other activities or equipment, not just from Decathlon. On especially cold days, below 0ºc the merino wool t-shirt worked perfectly to stop sweating and keep me warm when layered up, the Trekking tights with the thicker more technical snow trousers which I purchased provided more warmth and comfort and the tights doubled up as Long Johns in the sleeping bag for overnight. 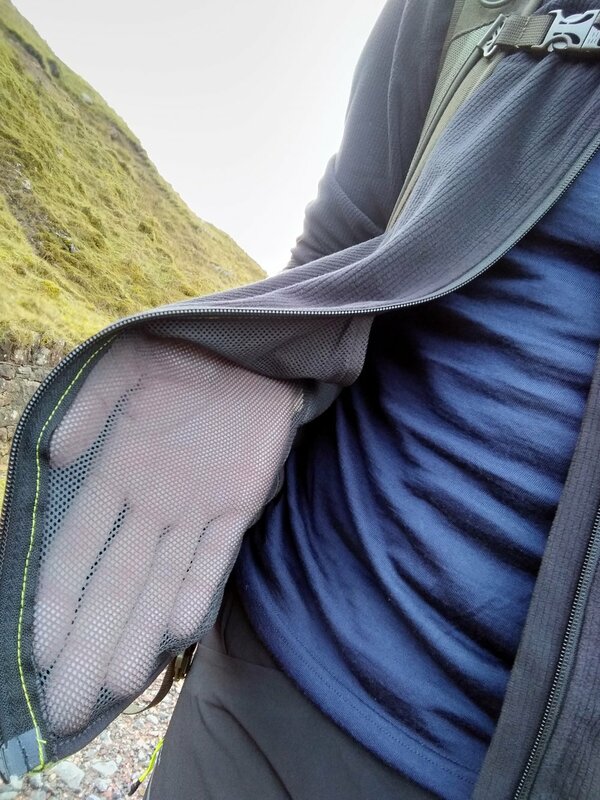 The Mountain gloves I have to say are some of the best touch screen gloves I have used, whether wet, cold or hot they worked in any of the conditions I used them in and like above, on particularly cold days or with snow, they became superb base layers below my thicker snow gloves. These three alone I went and purchased a second pair because of how cost effective and how much use I could get out of them. The Trekking fleece and waterproof jacket were good and for the price point do a great job and will do everything some more expensive fleeces and jackets do to a similar technical level. The waterproof jacket I believe will be a great option in Summer and warmer months with the large segments below the arms will provide plenty of breathability in the hot months and the Summer showers we will get, this jacket could easily shrug them off. Bonus to that, it’s lightweight and compact. When using the Trekking tights, fleece, gloves and even the Hiking trousers, I would be careful in wet weather, none of which are weatherproof or waterproof. So, care is needed and planning if rain is forecasted. Only the gloves and trousers are fast drying, but I wouldn’t depend on these as my only set up if venturing out for multiple days. The weakest in the range I do believe are the hiking trousers. They are cheap and very basic, personally the name of Mountain Hiking Trousers is perhaps a stretch to far, with pockets giving limited use, no weather/wind proofing or extra warmth. The hiking trousers are better suited to countryside walking and lower levels. When used in these locations, the trousers were good, certainly a lot better than walking around in jeans like many would and for a low cost, you wouldn’t be worried about them ripping or getting dirty. If you do plan to do something more adventurous and hike up a mountain or go on an expedition for multiple days, I would suggest investing in the next range up in Decathlon. To finish, the whole set up could set you back up to £250 which is a great deal considering the full set up. Of course, this will vary depending on the more technical you get but still not outrageous. To compare, I own trousers which cost half that and even technical shirts which cost a third so, what’s not to love when you can enjoy the outdoors without spending a small fortune and still being safe and warm in the cold weather.